Rollouts were performed using Snowie 4.1. 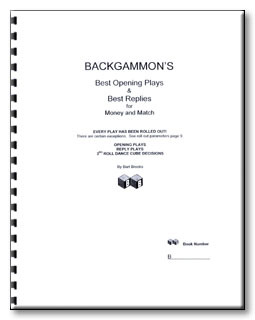 For opening plays, each play was rolled out 1296 times using 3-ply play and 3-ply cube. For reply plays, each play was rolled out 108 times, trucated at depth 7, using 2-ply play. A total of 27 opening plays and 567 reply plays were rolled out. COVER: Every play has been rolled out! There are certain exceptions. See roll out parameters page 9. Opening plays, reply plays, 3rd roll dance cube decisions. AUTHOR: Bart Brooks is winner of the 1974 European Championships at Monte Carlo, now called the World Championships, and has won many lesser tournaments in that time. Shortly following Monte Carlo he had a twenty-year hiatus from backgammon but has returned, arming himself with computer knowledge which every expert makes use of today. In the few tournaments he manages to visit he has done well. He is on FIBS as Black star and carries a 1900+ rating at present (October 2004).